Democrat Patty Wetterling lost her bid for Congress by 30,000 votes. But political observers say Wetterling, as a first-time candidate, made a good showing against incumbent Republican Mark Kennedy. Now many wonder about Wetterling's political future. Collegeville, Minn. — One of the first questions reporters threw at Patty Wetterling after she conceded her race to Mark Kennedy was "What will you do next?" She wasn't sure, although it's clear she'll still work as an advocate for missing children. "I can go back to many of the things I did," Wetterling said. "And I hope to further the message for a better, safer world for kids. I know I'll do it some way." She was a more forthcoming to her inner circle. Longtime friend Dan Carle, who spent a great deal of time with the Wetterling family after their son Jacob was kidnapped in 1989, provides some insight. 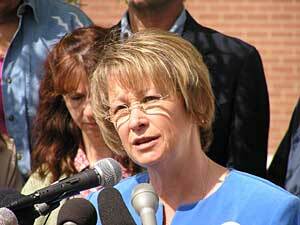 This week Carle asked Wetterling if she was relieved that her quest for Congress had ended. He was surprised by the answer. "As a matter of fact she didn't feel the relief, and felt more obligated to follow through with something she had started. I would guess she would at least entertain some notions of looking at running for this seat (again), or another one," Carle said. Carle says Wetterling is in transition. She's no longer happy to act as just a child advocate, she wants to actively protect children. Carle says that could come through a career in politics, or as a lobbyist, or by setting up a more politically active foundation for missing kids. She's now been seasoned, she's been through this baptism of fire with respect to a Congressional race, she knows what it's like. I suspect she'd be much better prepared (for a second run at Congress). If Patty Wetterling is interested in staying in politics, political experts say her first race for Congress was an effective move. Mark Kennedy is considered a possible challenger in 2006 for the U.S. Senate seat currently held by Mark Dayton, which would mean he'd give up his House seat. St. John's University political science professor Bob Webber says if that happens, Wetterling has a shot at an open U.S. House seat in just two years. "Patty Wetterling would have a leg up on any other candidate. She would be a favorite going into the race, even though it has Republican tendencies," said Webber. Even if the seat is open, it doesn't mean Wetterling would be a shoe-in for Congress. Kay Wolsborn, a political science professor at the College of St. Benedict, says Republicans could offer up a well-known candidate of their own in two years to run against Wetterling. "For example, say Mary Kiffmeyer, or somebody who has statewide name recognition, is put in on the Republican side. That would be a substantial competition for the two of them," she said. Wolsborn says Patty Wetterling learned some valuable lessons over the last six months of campaigning. She knows how to set up a campaign, and will likely have more time to raise money if she runs again. Wolsborn says Wetterling now has the advantage of political experience. "She's now been seasoned, she's been through this baptism of fire with respect to a Congressional race, she knows what it's like," said Wolsborn. "I suspect she'd be much better prepared, and I doubt that she'd lose any of the support she already has. And she conceded in a way that really left that option open." Wolsborn say Wetterling was a serious candidate for this election, and would have been ready to serve in Congress. But she says running a first-time campaign can be an effective strategy to lay the groundwork for the next election.